When they offered you a bite to eat, this is not exactly what you had in mind. 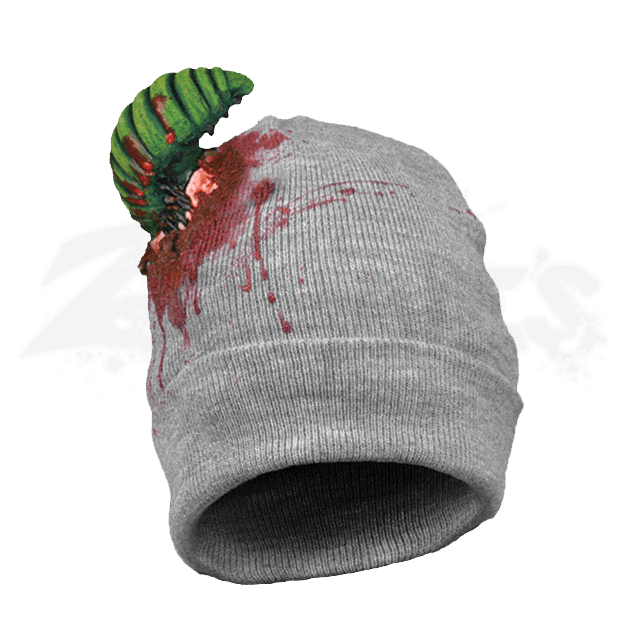 No one wants to wind up as food for an eerie green parasite, but when you wear this Bloody Brain Food Beanie, that is exactly what you will be. This grotesque example of horror headwear consists of a grey polyester knit beanie hat that, when worn on the head, creates the image of an awful looking attack. This hat comes fitted with a latex appliance that gives the image of a large green grub-like insect as it burrows into the top of the skull to feast on the wearers tasty brains. For Halloween, there is nothing better than an eerie injury like this one to really complete a costume or a gory look. Of course, this Bloody Brain Food Beanie is a perfect addition to alien attack costumes and frightening horror scenes, too.